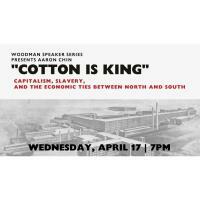 The Woodman Museum, which opened for its 2019 season this month, announces its April Speaker Series event, “Cotton Is King: Capitalism, Slavery, and the Economic Ties between North and South,” to be held on April 17at 7:00 PM. Hosted at the Woodman House, located at 182 Central Ave. in Dover, NH., the lecture will be free to members and $5 for non-members. Guest speaker Aaron Chin will deliver a talk exploring the forms of capitalism in the North and South leading up to the Civil War–and the North’s unspoken exploitation of the system of chattel slavery. When one thinks of slavery before the Civil War, the antebellum South often comes to mind. While the North was busy building factories and creating a capitalist society, the South, with its sprawling plantations and agrarian focus, seemed a far cry from its Northern counterpart. For many years, historians asserted that Southern slavery could not possibly be the same thing as Northern capitalism. This has changed. In recent years, historians have come to emphasize the capitalistic nature of slavery, asserting that the South was, in fact, every bit as committed to capitalism as the North. Further, the North profited economically from the expansion of Southern slavery. New England factory workers spun slave-grown cotton into clothing as Northern merchants extended credit to their Southern business partners. The industrialization of the Northeast relied upon the raw materials produced by the enslaved in the South. The event marks the third Woodman Speaker Series of the 2019 season. Speaker Series to be hosted at the Woodman Museum also include talks on period Seacoast furniture carving, the art of John Singer Sargent, John Wilkes Booth, oceanography, and other historical and special topics.